I’ve been trying so hard to think spring and be optimistic, but spring in Minnesota is really just an extension of winter. I’m enjoying the fact that it’s staying light past 7 pm. That is awesome. I’ve been able to find baby artichokes and good asparagus at the grocery store. Excellent, I can taste spring, even if I can’t see it. I bought a new sundress in anticipation of better weather. I finally spotted my first robin of the season. Who cares if it was perched on a nasty, gray pile of snow? Positive thoughts, think positive thoughts. Enter, Lamb Bolognese Sauce with Peas & Mint. It’s the perfect way to celebrate spring flavors in a realistic, still-cooped-up-in-the-house-and-freezing-my-behind-off kind of way. I love making Bolognese sauce. It’s a an hours long process, but if the weather is awful and you have a good book or the Sunday paper handy during the simmering downtime, it’s an absolute pleasure. Let’s get started. 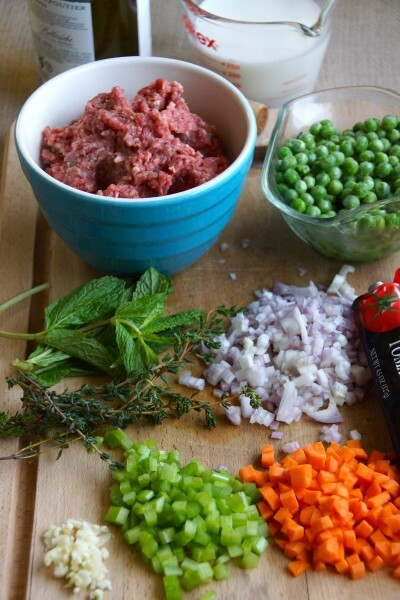 Grab everything you need and get it in one place: ground lamb, diced shallot, carrot, celery, minced garlic, tube ‘o tomato paste, peas, mint, thyme, milk, and white wine. Milk? Yes, way. It turns the sauce to velvet, you’ll love it. And white wine? 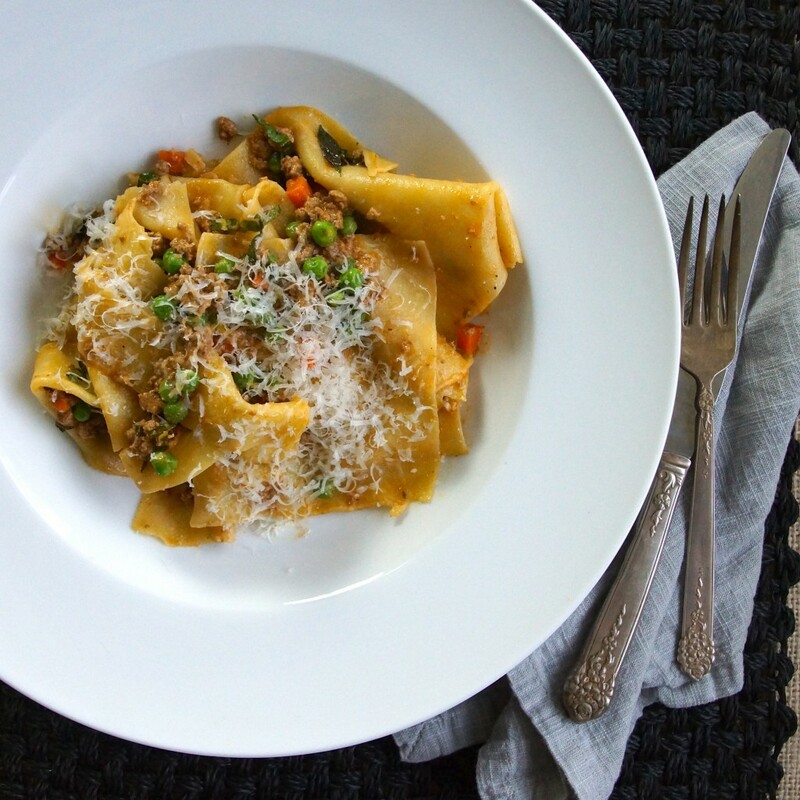 This is a spring lamb ragù, we want to keep it on the lighter side. Don’t worry–you can still drink red wine with it. Start building flavor. Sauté the diced veggies. Add the lamb and brown. Clear a spot and plop in some tomato paste. Pour in white wine, let the meat drink it up. Add the milk, simmer, simmer. As the liquid level reduces, add warm stock so the meat is always submerged in a warm, comfortable bath. Okay, the lamb ragù is well underway. Now we need something to serve it with. I had been thinking of gnocchi, but there was, uh, an equipment/cook malfunction. How about a quick batch of pasta instead? 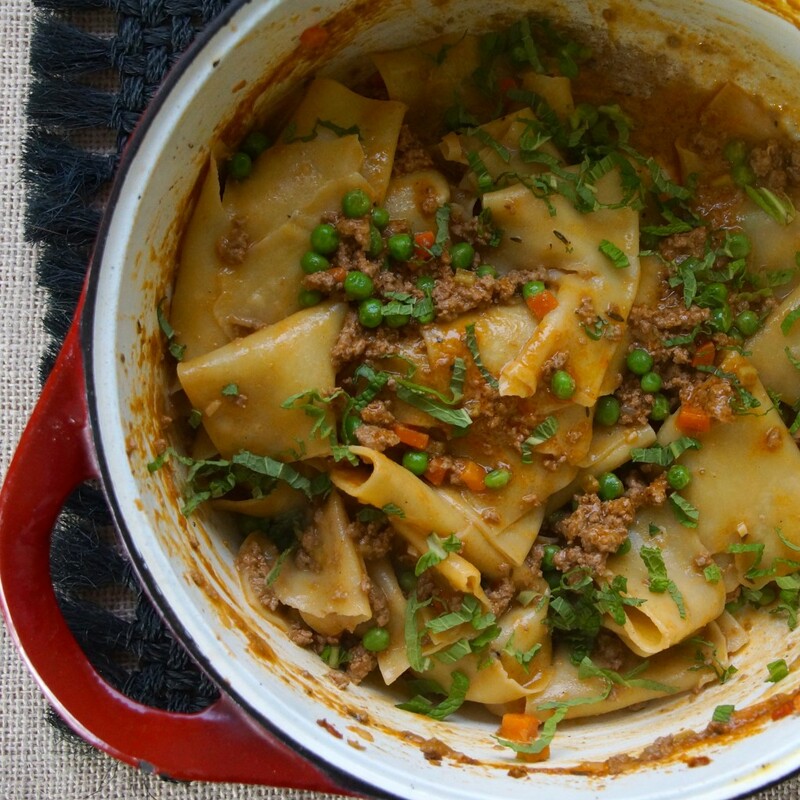 Put the finishing touches on your Bolognese. Toss in a cup of peas. Boil the pasta and add it directly to the sauce. Turn gently to coat the pasta evenly with sauce. Finish with plenty of fresh mint. The only thing that could make it better at this point is cheese. Let’s keep it in the family, and switch out our go-to Parmesan for a sheep’s milk aged Pecorino. Oh, yeah, I’m thinking positively now…positively delicious thoughts. This lamb ragù is delicious over homemade pasta (recipe follows), potato gnocchi, polenta. The recipe yields enough sauce for about 6 portions of pasta. Leftover sauce can be frozen. Place the ground lamb in a medium bowl and pour about ½ c. of the wine over it. Use your fingers to break up the meat. In a heavy-bottomed, lidded pot or Dutch oven, heat about 1 Tbsp. of olive oil. Sauté the shallot, celery, and carrot until slightly softened, about 3 minutes. Season with salt. Add the garlic and sauté for another minute until lightly golden. Add the lamb and season. Brown the meat and let the liquid cook off, lowering the heat as the pan becomes drier, about 10 minutes. Clear a spot on the bottom of the pan and drop in the tomato paste. Allow the tomato paste to darken slightly, then stir into the meat mixture. Add the remaining wine and simmer until most of the liquid has been absorbed, about 15 minutes. Add the hot milk, grate a little nutmeg over the pot, add the thyme. Simmer. When most of the milk has been absorbed into the meat (this should take about 45 minutes), add about half of the hot stock. Simmer (45-minutes-1 hour) and when most of the liquid has been absorbed, add the remaining stock. Continue to simmer (another 45 minutes-1 hour) until the sauce is thick and viscous. Remove the thyme stems and add the peas during the final few minutes of simmering. Check the seasoning and add salt if needed and plenty of freshly ground black pepper. Remove from heat and stir in half of the mint. Reserve the remaining mint to garnish your finished dish. If serving with pasta, boil the pasta and add it directly to the sauce. Grate Pecorino over the top of each dish and serve immediately. This basic pasta dough will yield a fairly sturdy noodle that will hold up to a hearty meat sauce. Sift the flour into a large shallow bowl or directly onto a clean countertop. Create a well in the center as if the flour is a volcano. Whisk the egg with the olive oil and water in a small bowl and add to the flour well. Using a fork, incorporate the liquid ingredients into the flour. When all of the liquid has been incorporated, knead the dough until it is smooth and elastic, about 3 minutes. Pat the dough into a disk, wrap tightly in plastic wrap, and allow to rest at room temperature before proceeding. After the dough has rested, divide it into 6 rectangular pieces. Using a pasta roller, roll each piece into a thin, long sheet. Roll it through the thickest setting first, then gradually work your way down to the thinnest setting. Dust the dough with flour, as needed, to prevent sticking. Place the rolled dough on lightly floured, clean kitchen towels until you have finished rolling out all of the dough. Cut the dough into desired shaped. I did free form squares to serve with Bolognese sauce; a wide pappardelle or tagliatelle would also be nice. Boil the pasta in abundant salted water until it floats to the top. I use my stock pot and boiled the pasta in 3 batches--you don't want to crowd the pot and you don't want to lower the water temperature by dropping all of the pasta in at once. Pick the cooked pasta out of the pot, allow the excess water to drain off and immediately transfer to the hot sauce. Serve in hot bowls. Buon appetito! This sounds amazing!! Yum… I am going to try a quick version tonight. The Bolognese sauce was delicious! Thank you for the recipe! Two things: you mentioned onions, but there weren’t in the instructions. I used 1/2 cup and that was perfect. The other thing is this recipe barely fed two people! One was my very hungry husband! Next time — and there will definitely be a next time — I’ll double or triple it!! I made gluten free pasta which was also yummy! Thanks again for a fun afternoon in the kitchen and a delicious dinner! Sorry there wasn’t more, but I’m glad you liked it! Hi, making this now, but wanted to confirm that in Step 2 of the bolognese, you’re to saute the shallots, celerey, and carrot, right? That’s what the photo shows., but the recipe says to saute the shallot, celery and onion… Thanks! I wanted to make this for months. I did last night. It was amazing. It looked just like the picture and tasted awesome. Thanks.